Venture out of the city with trips to Multnomah Falls (in Bridal Veil), Evergreen Aviation & Space Museum (in McMinnville) and Sokol Blosser Winery (in Dundee). Dedicate the 9th (Sun) to wine at some of the top wineries in the area. 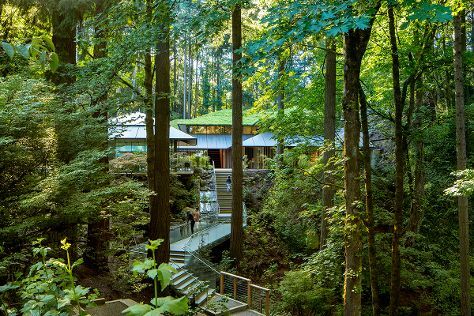 There's still lots to do: admire the natural beauty at Portland Japanese Garden, stop by Powell's City of Books, immerse yourself in nature at Ecola State Park, and meet the residents at Oregon Zoo. To find maps, traveler tips, photos, and more tourist information, you can read our Portland road trip planner. San Francisco to Portland is an approximately 4-hour flight. You can also do a combination of train and flight; or drive. While traveling from San Francisco, expect a bit warmer days and about the same nights in Portland, ranging from highs of 77°F to lows of 56°F. Cap off your sightseeing on the 10th (Mon) early enough to travel to Fort Worth. Get out of town with these interesting Fort Worth side-trips: Dallas (Dallas World Aquarium, The Sixth Floor Museum at Dealey Plaza, & more) and The Escape Game Dallas (in Grapevine). There's still lots to do: steep yourself in history at Fort Worth Stockyards National Historic District, admire all the interesting features of AT&T Stadium, get engrossed in the history at Texas Civil War Museum, and browse the exhibits of Livestock Exchange Building. Plan my day in Fort Worth using traveler tips and tourist information provided by Inspirock. You can fly from Portland to Fort Worth in 7 hours. Alternatively, you can do a combination of flight and bus; or drive. The time zone difference when traveling from Portland to Fort Worth is 2 hours. Expect somewhat warmer temperatures when traveling from Portland in June; daily highs in Fort Worth reach 92°F and lows reach 73°F. Finish your sightseeing early on the 15th (Sat) so you can travel back home.